As someone who loves eggplant I constantly try to find new ways of making it. Eggplant is not the easiest thing to cook because it has a weird texture, and the seeds inside make it very bitter. My mum would always make this casserole with eggplant and it always tasted perfect. If I try to make the same thing it doesn’t taste anywhere near her cooking. But I’m Persian and Persian cooking is usually an all-day affair. A lot of times they actually advise you to let the eggplant sit while soaking in salt but I just don’t have the patience for that kind of thing! 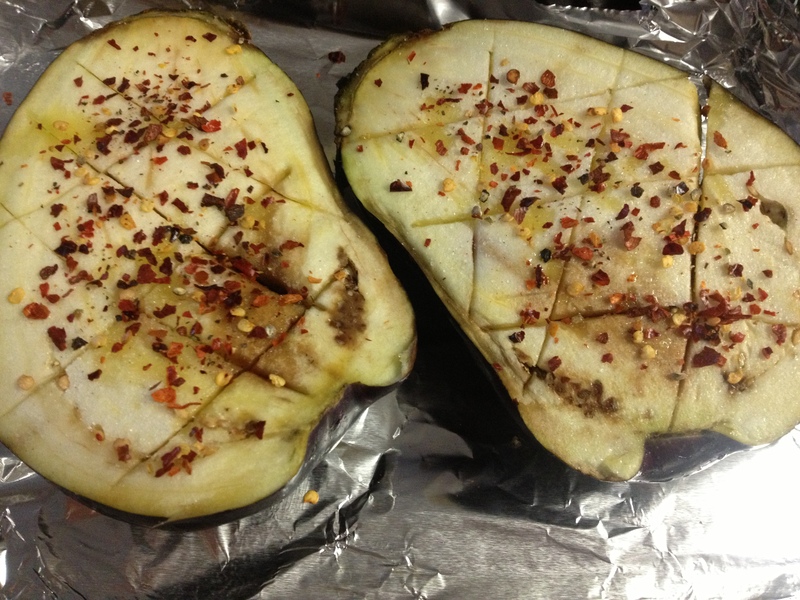 So anyhow, I wanted to try roasted eggplant because it sounded delicious and searched for a few recipes online. 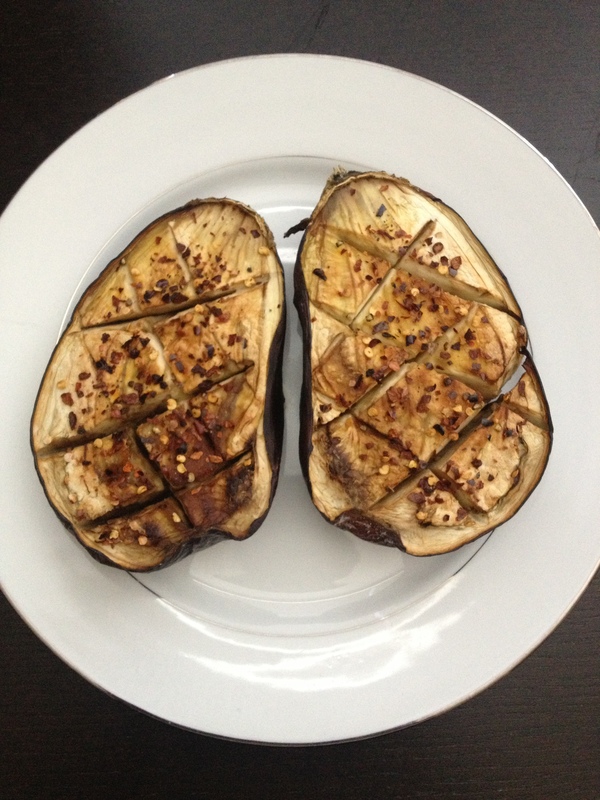 After trial and error I found that the best way to cook eggplant is at 420°F for 1 hour. 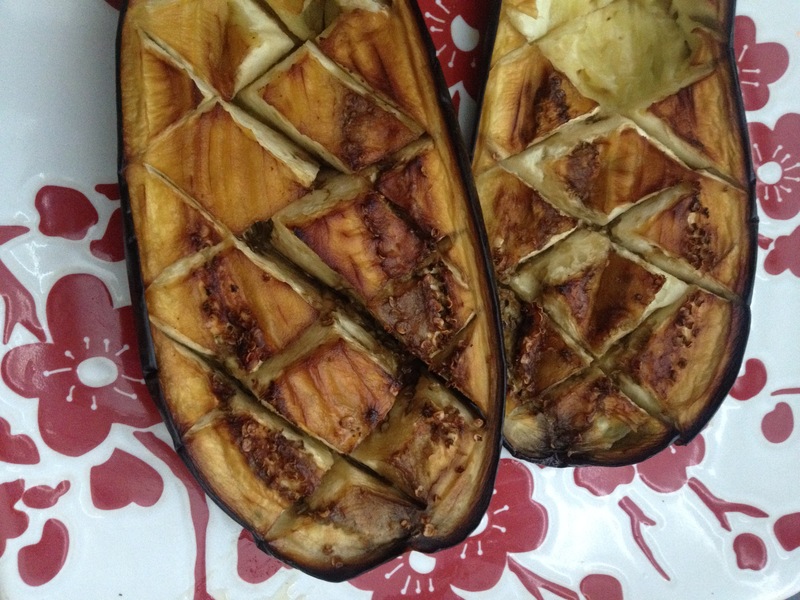 It is also best to cut the eggplant in half and cutting the eggplant in diamond cross-hatch patterns. It is also a good idea to use a good amount of salt to reduce the bitterness from the seeds. A lot of the recipes also called for a lot of oil but that didn’t sound entirely healthy so I actually found that cooking with Earth Balance (dairy free) butter was best. I simply spread about a tablespoon of the Earth Balance butter on each half, which isn’t terrible especially if you are just eating the eggplant. The Earth Balance butter is usually made up of good fats also. For some reason the butter also made the eggplant come out better than the oil to me. And for other seasonings you could pretty much put anything you wanted on it like thyme or lemon. Being the spice freak that I am I of course put chili flakes on mine. I honestly think eggplant when roasted tastes best simple, with only salt to season. So I think you can see a difference. With the oil the eggplant was still somewhat dry. With the butter the eggplant came out perfect and even the skin ended up crispy, which was delicious. You may think you shouldn’t eat the skin but it actually contains a lot of vitamins. The skin of the eggplant actually has a phytonutrient called nasunin, which is a powerful antioxidant that is highly beneficial for your brain, cardiovascular health, and even for women who can lose a lot of iron. So overall this was a really easy way of cooking eggplant that came out really well. I’ve tried slow-cooking it in my crockpot and it didn’t turn out great, so this is definitely something I often make now to eat for lunch.